Calico are a dynamic band fusing the styles and talents of people from an assortment of musical backgrounds, resulting in a high energy, exciting and crowd pleasing band that will be sure to fill the dance floor! We are professional musicians doing what we love, pure and simple. Our ethos, to deliver top quality live music, no tricks no tracks, a LIVE performance in its purist form. We give 100% every time we play, as we know our audience expect nothing less. Individually we have at least 15 years playing experience, so as a group we have a lifetime! This, supported by a fantastic and varied catalogue of songs which allows us to read a crowd and play exactly what you need for an unforgettable night! 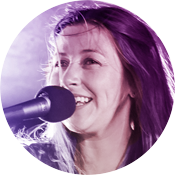 Lead vocalist Gemma originally from Wales, has been involved in performance from a very young age. she was welsh junior ice dance champion and a keen artist. But it was music introduced to her by her grandmother and father that ignited a passion for singing and song writing. She learned guitar and joined various groups playing in Andorra and Spain where she met her future hubby John. The pair formed Calico and an immediate musical chemistry was born. 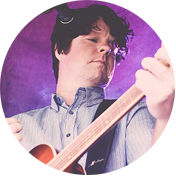 Guitarist and vocalist John was born in Ireland and was immersed in music from a young age. Following in the footsteps of his dad he began playing in local bars in his home town Derry at the age of 16 and moved through various bands playing the vibrant pub scene, wedding band gigs and in original bands too. After he graduated from the University of Hertfordshire with a degree in music technology he travelled globally and along the way met his now wife Gemma. In 2009 they settled in a Queenstown and began playing as the duo Calico. A native of Invercargill, Tahne is a multi talented musician and vocalist. In Calico his performances as a drummer are only outshone by his amazing third part harmonies that complete the Calico sound. 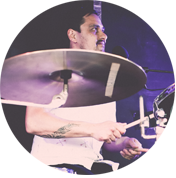 He joined the group in 2010 and since then has been an intricate part of the bands energy, professionalism and sound. An avid songwriter, producer and studio engineer he lives and breathes music. 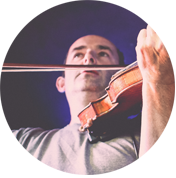 Multi instrumentalist and the latest member of Calico, Jamie Relton began playing music as a child in the U.K. His musical accolades are too many to list, but in brief he is an excellent pianist/keyboard player in many styles, a guitarist, a harmonica player and an unbelievable fiddle player. His huge versatility and musical knowledge bring a whole new level of excellence to the band and its ever expanding repertoire.